This is the story of Anna Wang, a fourth grade bookworm. She is a quiet Chinese-American girl whose mom speaks Chinese, but whose father does not. She begrudgingly (at first) attends Chinese school on the weekends, and is embarrassed about her mom being a house cleaner and not having a driver’s license, and her dad working at a liquor store. Some of the other girls at school exclude her and make her feel bad for not having the most fashionable clothes, but Anna puts on a tougher exterior, even though it bothers her inside. Anna is happy sewing, making paper airplanes, or painting, but is happiest when reading. Laura is a girl in her class whose family has problems, and Anna becomes a good friend to her, even if Laura wasn’t always a good friend back. I picked up this book because I judged it by it’s cover. 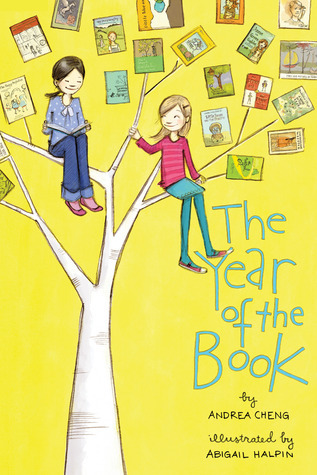 There is a picture of a tree with two girls and a bunch of very familiar titles and book covers on it. Book covers on a book cover. A book about a girl who reads books. Sounds like me as a child (the victim of bullying and all). There were book references in it, but it wasn’t quite what I expected. What I liked about this book was the way Anna was able to be who she was without stooping to the level of her bullies. She valued her books and her culture, and knew her priorities, even if she was in a “stage” that was difficult for her mother. Also, the DIY on a drawstring bag was super cute and appropriate for a third or fourth or fifth grade girl. While it is a much lower level than most of my class, I know a few girls who may enjoy the creativity and DIY aspect! What I didn’t like about this book was that it wasn’t very memorable. It was a super fast read (being at a third grade level). There wasn’t a whole lot of substance to it, and things the author could have written about to make more of an impact were danced around. It makes sense. I’m not faulting her for that, because it is written to younger children. It was a good portrayal of bullying that goes on in school, which is important to see for all ages of girls. This is a cute story about a cynical girl and her super hero squirrel. Flora is a self-proclaimed cynic who lives with her mother (the arch-nemesis) and visits with her father. She and her father share a love of a particular comic, called The Illuminated Adventures of the Amazing Incadesto, with a segment called “Terrible Things Can Happen To You.” Both of these are referenced throughout the story, and there are many comparisons in the story lines. 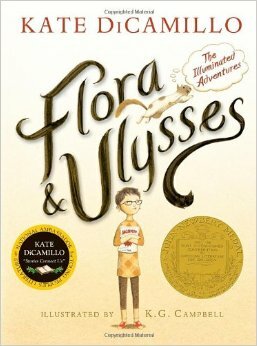 So Flora comes upon a squirrel named Ulysses, whom she rescues from her neighbor’s vacuum cleaner. Upon rescuing him, she discovers he has super powers, including the ability to fly, type poetry, and communicate with humans. Flora and Ulysses make an instant connection, but Flora’s mother disapproves of a squirrel living in her household, and tries to get Flora’s father to murder him with a bag and shovel. Yikes! Flora and Ulysses have to work together to battle several intrinsic and extrinsic conflicts, including Flora’s mother’s hurtful words, evil cats, and the ability to change one’s outlook. What I liked about this book… well, there were several things. First of all, DiCamillo continues to write beautifully complicated characters. Flora is a child I’d enjoy having as a student in my class. She is thoughtful, self-aware, and cynical. She’s a thinker. She and Ulysses have several interesting “friends” in the story, who each have backstories and contribute to the plot in a meaningful way. While those stories are difficult to read, we feel their pain and their strength and the love they feel for our hero and heroine of the story. Another thing I liked was the wonderful illustrations (it is The ILLUMINATED Adventures, after all). Several chapters are in the form of comic strips, which go nicely with the idea of Flora’s favorite comic book. Ulysses is, himself, a super hero, so naturally, it would make sense to put him in a comic. What I didn’t like about this book was… I’m not really sure how to explain… while it has all of the qualities of a great novel, I lost focus half way through and picked up another book. Maybe that was my fault, because it really is a good book and an easy read. I have found that DiCamillo writes these sagas that have an end goal, but move from place to place to place, and it kind of gets fuzzy in the middle. Or maybe I’m just ADD, which is a completely reasonable and likely explanation. This is definitely a good read. It is funny, sad, heart-warming, and suspenseful all at the same time. I can see why it won the John Newbery Medal for 2014. Update/Side Note: I’ve read 14 books in 10 weeks. I should be a lot farther along, but it’s been a busy couple of weeks! Thank you Megan for your recommendation, and for letting me borrow your book! I have always been a fan of the Laura Ingalls Wilder books. 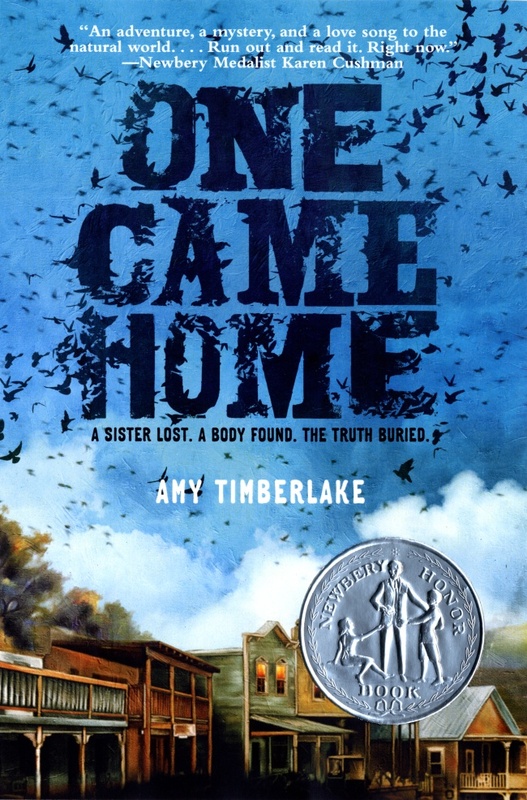 I loved the way she told her story, but also taught me what it was like to grow up on a prairie, in a small town, as a homesteader, or where ever she was living at the time (depending on which book I was reading). My favorite was The Long Winter, because we got to learn about Almanzo Wilder and their love story began. This isn’t Laura Ingalls Wilder. It isn’t an average family in an average western town living average lives. However, it does tell the story of a feisty Georgie Burkhardt and her experience in 1871 in a small town, Placid, Wisconsin. Her sister Agatha disappears after following some pigeoners, and then a body is found. Everyone assumes it is the badly decomposed corpse of Agatha due to the dress the body is wrapped in and the auburn hair. However, since her face was shot off with a rifle and the body was dismantled by animals, it is virtually impossible to identify (yes, a little gruesome- see “what I didn’t like about this book”). The body is buried and the family mourns, all except for Georgie, who refuses to accept the truth. She sets off with her sister’s former suitor (one of two) to find out the truth and prove her sister is either still alive, or at least not the corpse they found. It becomes an adventure in the wild west (sort of), with danger, mystery, love, and an education in pigeoning. What I liked about this book was the history lesson. If I was to experience life during another time period, I always thought it should be life as a pioneer or in a pioneer town, probably due to my Wilder obsession. I wanted to wear long dresses made of calico, listen to the wind blow the prairie grasses, and wear tall boots on Main Street (because they’re all called Main Street) in the mud. I also like when the character is a strong and well-developed. What I didn’t like about this book was that it wasn’t totally age-appropriate. Being written at a 4.8 level, I can’t imagine many fourth graders reading about the stench of a decomposing body, the rippling muscles of a hot 19 year old, or a girl kissing said hot 19 year old while being engaged to another full-grown man. Or the shooting. Or the allusions to death. Or Georgie’s consideration of God’s existence or decision whether to murder a man or not (in defense of the hot 19 year old). As an adult reader, these are all interesting dilemmas and turns of events, but I just can’t see one of my students appreciating it. I have to mention that this book is a Newbery Honor Book. There were several under the “honor” category this year, so I’m on a quest to find out why.